Sweet potatoes and black beans make a fabulous combo. Both are super foods so when you make and enjoy this Sweet Potato and Black Bean Salad, you’ll be eating double of Nature’s goodness. It’s a perfect fall dish and can be the star in a vegan meal or paired with your favorite meat. Sweet potatoes are chocked full vitamins, minerals and other good things for your body. They are a great source of beta-carotene and vitamin A. They also contain vitamin C. They are full of antioxidants, anti-inflammatory nutrients and blood sugar-regulating nutrients. That’s great news for diabetics. 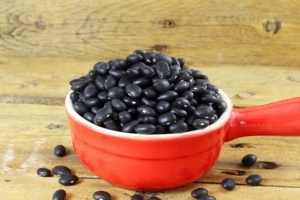 Black beans are high in protein and fiber. They contain potassium, calcium and magnesium, which contribute to lowering blood pressure. Both sweet potatoes and black beans contain cancer-fighting properties. Heat oven to 400 degrees. 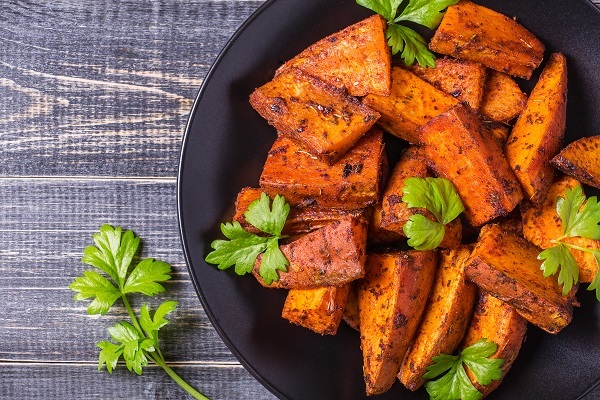 Place sweet potatoes in a bowl and toss with 1 tablespoon of the olive oil and with the cumin and cayenne pepper. Spread potatoes onto a baking sheet (line with parchment paper for easy clean-up). Cook 15 to 30 minutes, until tender. Toss midway through cooking time and check for doneness. In a small bowl, whisk lime juice, 3 tablespoons oil, and salt and pepper to taste. Set aside. When potatoes are done, mix with the beans, onion and cilantro. Drizzle with the dressing. Serves 4. NOTE: if you want a milder onion flavor, roast the onion with the sweet potatoes. Mark Bittman, of the New York Times, has a delicious recipe that includes a chile dressing. Either recipe is easy to adapt to appeal to your own taste.